This tutorial provides you with a foundation for working with the magic extractor in Adobe Photoshop Elements. It is the ninth lesson in the Adobe Photoshop Elements 10 Digital Classroom book. 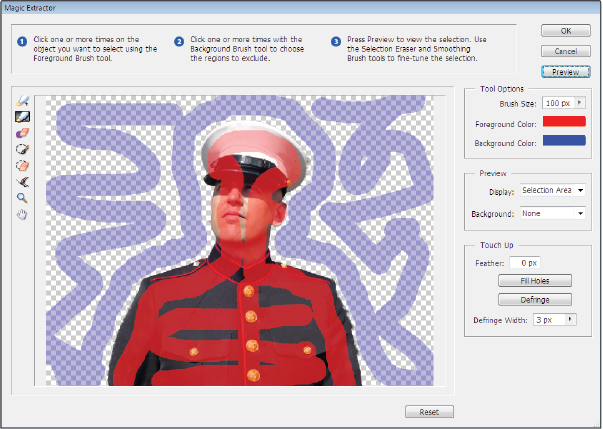 The Magic Extractor makes it easy to select people or objects so that you can superimpose them on other backgrounds. You’ll use it as a way to silhouette the marine image in this exercise. Use the Magic Extractor to make accurate selections based on the appearance of foreground and background areas that you specify. You define these areas by placing colored mark adjust the brush size by adjusting the Brush Size value and click and drag multiple times to mark the area you want to extract. 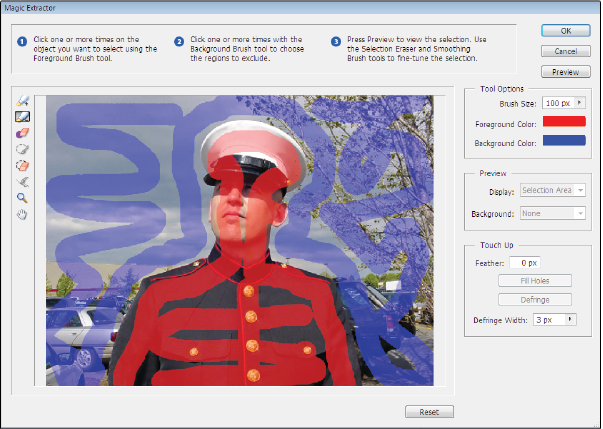 In this case, click the Marine’s hat, face, and uniform. 1 In the Layers panel, click to select the Marine layer. 2 Choose Image > Magic Extractor. The Magic Extractor dialog box opens with the Foreground Brush tool ( ) selected by default. 3 If desired, adjust the brush size by adjusting the Brush Size value, and click and drag multiple times to mark the area you want to extract. In this case, click the Marine’s hat, face, and uniform. 4 Choose the Background Brush tool ( ) and click and drag multiple times to mark the area that you do not want included in your selection. In this case, click on the sky, the cars in the background, and the tree. Use the Magic Extractor to remove an unwanted background from an image. When selecting objects with varied colors and textures, you can drag across all the colors and textures to ensure a more accurate selection. 5 To help with your selection, try using the Zoom tool ( ) or the Hand tool ( ) to magnify and navigate around the photo. 6 To specify a different brush size, choose a new size from the Brush Size field. You can also use the keyboard to increase or decrease the brush size. Pressing ] (open bracket) increases the size of the brush while pressing [ (close bracket) decreases the brush size. 7 Click Preview to see the current selection. Press the Preview button to preview your selection. 8 To add to or subtract from the selection, place more marks in the image using either the Foreground or Background Brush tool. You can press the Preview button again to see the effects of your new extraction. In areas where the color in the foreground is similar to the color in the background, you may need to “fine tune” your selection by accurately painting over the areas that you want to keep or remove. 9 Press OK to extract the selected areas. If you want to start over and remove all marks, press Reset. You should now see the image of the Marine, silhouetted from its background. 10 Use the Move tool ( ) to reposition the Marine layer to the lower right side of the image, as shown. 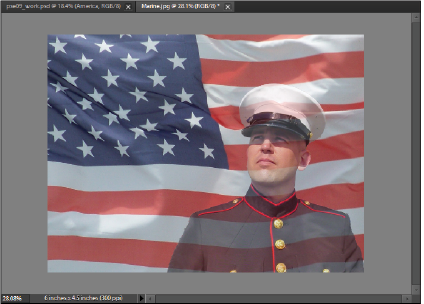 You can see through the background of a silhouetted image to the layer or layers below. If you haven’t been successful in removing the entire background, try some of the methods listed in the sidebar below. To erase foreground or background dots, select the Point Eraser tool ( ) and click or drag over the marks you want to remove. To add areas to a selection, select the Add to Selection tool ( ) and click or drag over the area you want to add. To remove areas from the selection, select the Remove From Selection tool ( ) and drag over the areas you want to remove. To smooth the edges of your foreground selection, select the Smoothing Brush tool ( ) and drag over the areas you want to smooth.